Even though it’s only three weeks until I finally get to marry my dream man, I don’t this fact has full hit me. Strangely enough, I am more at peace now that I was a few weeks ago. Gone is the frantic panic, stress of people wanted it their way and guest list woes. Now its pure excitement coupled with a surreal calm. The only thing I can attribute this to is prayer and pampering. God has blessed us with way more than we could have imagined and thank goodness we don’t have to get through marriage without Him guiding us and showing us how to love unconditionally. My fiancé is not a fan of a stranger massaging his back, but I think he may be converted after our Santé Wellness Couples massage. Massages are my favourite form of indulgence as I build up rock-size knots of tension quite easily, but this was my first massage with him. We were ushered into a room with a red hue and asked to lie beneath the towels on our own massage bed. First came the oil, the massage and the dozing off. Whilst you don’t actually talk to each other, it’s something you’re experiencing together and you’ll both leave feel lighter and more relaxed than you did before you went in. Nature has the most calming and joyful effect on me. Whether I’m on the beach or in a garden, I feel like I’m where I should be. 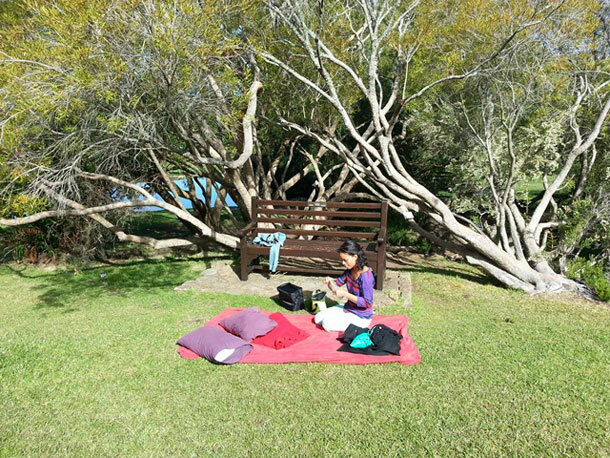 We decided to go for a picnic at Kirstenbosch gardens. We got a chance to use one of our engagement presents which was a voucher for Woolies to be used on scrumptious picnic food. The picnic blanket, mini prego rolls, millionaire chocolate pieces and large bag of yummy edibles came along with us as we lay beneath a tree beside a stream. Geese flew by, guinea fowls run past, the sun came and went and the most strenuous thing we did was open a bottle of lemonade. It’s really not about the money you spend; you could picnic on the beach with hotdogs, take a train for a day to the furthest point of the peninsula or take a walk in the forest. But take the time out to do things just for both of you. Your sanity, soul and relationship will appreciate it.